Traders will know this stallholder for his unique leather character purses although his display has always lacked the merchandising professionalism his product demanded. We want to congratulate him on transforming his stall presentation from a single flat table display to this well merchandised version, complete with walk-in and identifying signage. Well done! 1. McDonalds first quarter profit edges up. 2. Fusion Retail Brand putting Colorado Footwear back on the market. 3. Clothing brand Ellery agrees to continue supplying Myer as well as David Jones. 4. French luxury group Hermes reports 10% rise in first quarter sales due Asian demand. 5. Sass & Bide open first outlet in Melbourne’s revitalised Brand Smart discount centre. 6. Deloitte Access Economics predicts retail will improve as long as interest rates remain low. 7. Japanese fast fashion giant, Uniqlo, will open its first Australian store at Melbourne Emporium later this year. 8. Apple’s profit dips for first time in nearly a decade. 9. David Jones launches first ever multi channel digital campaign around denim. Retail World's conference and trade show is being held at the Melbourne Exhibition Centre on 13th and 14th May. This year the show will be joined by Cards & Payments Australia so those traders who are unhappy with the current EFTPOS service may like to see what other options are available. As well there will be stalls with accounting software, merchandising tools, and multi-channel retailing advice. Go to the link below to register. One of our traders has suggested that a temporary cure for retailers anxiety can often be found in a Mr. Bean video. Here is one of our favourites. Should QVM Traders Stop Display Overload? Some of our traders adopt floor to ceiling display merchandising. You know the format – products going as high as positioning hooks will allow, sometimes not just on the sides of the stall but at the front and even out into the aisles. There are arguments to suggest that this type of display is anti-business. Distraction – shopping at QVM is a little like shopping in a supermarket. There are just so many things to look at that it is easy to be distracted and overhead displays simply add to the problem. How often have you had a customer say they couldn’t find you even though they walked up your aisle earlier in the day? Lighting – dim lighting is a real problem at QVM and “block-out displays” simply don’t help. Not only are you restricting the light that falls on your stock, you are stopping light from falling on your neighbours stock. Contemporary Display Practice – contemporary retail displays have lowered stock to meet modern customer demands. Key retailers like Target and K-Mart abandoned floor to ceiling stock displays some while ago and even markets like Spitalfields (London’s oldest market) show a big open space above stalls so that buyers eyes are kept on the key stock at or around eye level. Laziness – trying to show every stock line you possess is easier than regularly changing your display. Hands on traders know that setting up your stall in a different way each week can keep your stock fresh and interesting for customers. Effective customer service will quickly let your customer know if you have what they are looking for. Time Hungry – think of how much setup time could be saved by keeping displays to around 2 metres. Contemporary retail practice in shopping centres and markets, would suggest that floor to ceiling block-out displays may no longer be appropriate. What do you think? 27/4/2013 2055 Overhead Displays "What we really need overhead at each stall is a business name sign that would make it easy for customers to find traders and be a lot less confusing than stock block outs." Could This UK Market Be A Template For QVM? The similarities between Spitalfields, London's oldest market, and QVM is more than just Victorian architecture. Spitalfields underwent a “re-generation” in 2005 which involved new market areas, updating of old market areas and a re-think of the market’s role in London’s life. The fresh fruit and vege areas had moved offsite many years earlier although there is an organic food section in the re-generated complex. The Spitalfields re-generation included many considerations like, community activity centre, functions and special event centre, and a swing to more food including cafes and restaurants. Spitalfields moved from a successful Sunday only market to a 7 day a week model with shopping for fashion and interiors, original artworks, second hand goods and food. The market was made more open with considered use of glass to protect the shoppers from the evils of London’s weather while keeping light and vision at a premium. Interestingly, Spitalfields uses very similar lighting to QVM although natural lighting through skylights is superior. Spitalfields is smaller than QVM (most markets are) with less than 150 traders on a busy day. In fact there are many ways that QVM trumps other markets. The size of our market and the fact that you can pretty much get anything you want in one place has kept us in the forefront in the past. However, things change and renewal is now needed. It is a great challenge for Melbourne. The challenge will be to renew without destroying the character of one of the world's great markets. As discussion on QVM’s renewal progresses, it will be interesting to see what impact recent overseas markets renewals, like Spitalfields, will have on our deliberations. 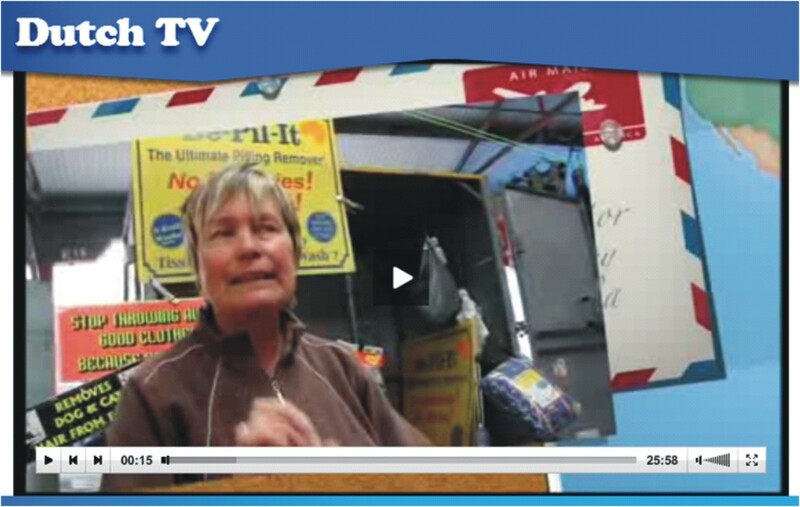 Trader Annette has informed us of an episode on Dutch TV including a story on QVM and she is the star. Click on the link below to go to the program and sit through a minute or two of discussion before Annette has her say. It is easy for traders to become obsessed about their role in QVM re-development but there are other major stakeholders, particularly customers, who need to be heard. Here is a letter published in Melbourne's Age newspaper. "If the Queen Victoria Market traders think that a bar and restaurant, a plaza or community garden will attract more customers, they are dreaming (''Queen Vic poised for $100m revamp'', The Saturday Age, 20/4). What attracts customers is value, service and variety, together with accessibility. I spend about $300 at the market every week, so anything that disrupts accessible parking, even temporarily, will encourage me to shop elsewhere. More cool rooms and longer hours may be necessary ''improvements'' but if the only way to pay for them is to destroy much of the market itself. 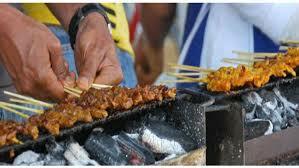 What attracts tourists is the fact that it is a working market. It is also concerning there has been no attempt to invite public discussion of the proposed changes, nor any recognition that the market ''community'' is more than the traders. It seems we are again seeing an attempted land grab by developers." 24/04/2013 17:31:36 customer feed back "I agree with the shopper from hawthorn. 1. Myer takes clothing manufacturer, Kym Ellery, to court over supplying a competitor. 2. IbisWorld report predicts double digit growth for online sporting and recreation goods in the next 12 months. 3. US retail sales fell 0.4% in March. 4. Finnish clothing brand Marimekko to open 3 stores in China. 5. Louis Vuitton group to buy Australia’s R.M.Williams. 6. Melbourne’s Eastland Shopping Centre to receive $500 million upgrade. 7. Independant Australian bicycle retailers to band under Bike Centre name. 8. Harvey Norman plans to build office towers above some of its retail stores. 9. Dunn & Bradstreet says credit card usage on the rise. 10. Harvey Norman sales up slightly in March quarter. 11. Burberry international sales up 9% boosted by Chinese demand. 12. Priceline profit rises 6.8% on flat sales. 13. Victoria’s Secret opens first store in Perth. 14. Commonwealth Bank reports card spending up 1.3% in March. One of our Trader Representatives met with management this week to discuss the issue of dim lighting within the upper sheds. Lux meter readings were presented to management showing that some stalls have sub-standard lighting levels. Discussion took place on extending skylights to take full advantage of natural light, choice of globes, assessment of lamp heights, and alternative lamp types. The extension of skylights does increase the risk of heat in summer and it was agreed that the south side of roof structures (away from the sun) would provide the best opportunity for increasing light while minimising heat transference. Additionally, new developments in the ability of skylight panels to reflect heat would be considered. Management said they had a number of options to consider for problem lighting areas and that they would get back to us. We will keep traders informed. Today’s Age newspaper contains a report on the Lord Mayor’s re-development funding project involving two 50 storey skyscrapers. Funding will depend on government approval but in the meantime the report contains some interesting information on what might follow that approval. 1. A 6 day trading week. 2. Uniform hours from Tuesday to Saturday with later trading on a Friday. 3. New food products, consistent with a fresh food and market theme. 4. Consideration of a new bar and restaurant. We want to stress that these are only recommendations and we have no reason to doubt management claims that final re-development will only take place after full consultation with traders. Nevertheless it is interesting to read what independent economic advisers have recommended to the Melbourne City Council in the recent past. We will let readers speculate on what each of those recommendations might mean. The following video is from the Sydney Morning Herald and also available from the Age. The video contains interviews with Queen Victoria Market Traders concerning the re-development funding announcement made in Thursday nights Channel 7 News. Basically traders are saying they knew nothing about these plans before the news item. What Does The QVM Re-development Announcement Mean? Actually the announcement on Channel 7 News on Thursday night was not so much a re-development announcement but more a funding announcement. 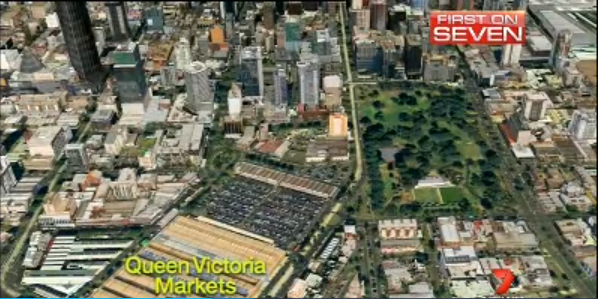 Melbourne City Council wants to re-develop the Queen Victoria Market but needs $100 million to do it. That amount of money doesn’t come out of thin air, particularly when our State Government is cash-strapped. So a plan was devised to take a bit of Queen Victoria Market, a bit of Franklin St. and some street car parks and sell them for development. In this case, two 50 storey skyscrapers. The funds from the sale of this land would finance the QVM re-development. The plan is before State Government for approval. This funding is just the start of the process. Traders will be particularly interested in the detail surrounding how the money will be spent if and when funding comes through. How will the market be re-developed and how will that influence traders? These are the questions that will have a big impact on the future of the market and the livelihood of its major stakeholders. 22/04/2013 11:50:34 $100,000,000?? " Sadly to say,this money has been spent already!! We the traders will not see a RED CENT spent on our beloved market!! Firstly,they have to improve on a carpark facility for the customers to use. 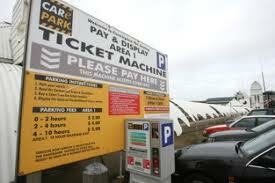 Secondly they have provide a carpark for the customers to use. Thirdly do they want to improve the carparking for the customer base that we have? Here are the before and after photos of how QVM will look if the State Government approves the Melbourne City Council plan for two 50 storey skyscrapers outlined on Channel 7 News last night. The first photo shows the current market alignment and the second photo shows how things will look with Franklin St. being re-positioned through the current car park and the two skyscrapers built. As Queen Victoria Market Traders complain about the lack of free car parking for their customers, Melbourne City Council embarks on a plan to further restrict the use of cars in our fine city. Melbourne city councillor Cathy Oke said walking was the dominant mode of transport in the city centre and city streets would come under more pressure as the population grew. Two-thirds of all trips within the city centre are on foot and this is expected to rise to 80 per cent by 2030, the plan states. Cars, which make up 15 per cent of trips, will be cut to just 5 per cent by 2030 if the plan succeeds. ”No city in the world is designing their city for increased car travel,” Cr Oke said. Queen Victoria Market competes with local and regional shopping centres who almost all offer year round free parking for their customers. Shoppers who want to load up their bags with food and other goods need the convenience of car access. Our car parking fees are simply not competitive and this new push by Melbourne City Council is not going to help. 19/04/2013 17:48:38 car parking "It seems to me, after all the rhetoric, about the old girl(the market) needing a face lift etc etc, unless there is parking, there will be no market full stop. 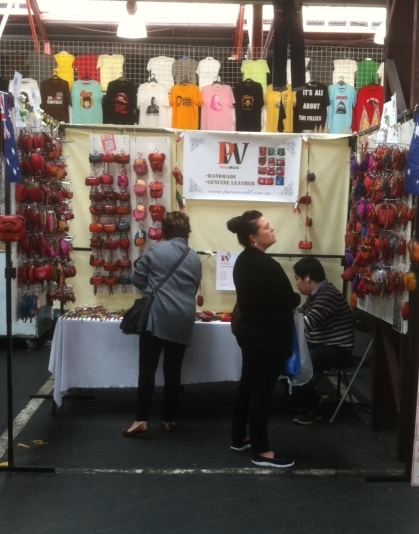 22/04/2013 12:43:34 Sth melb mkt "Yesterday,being Sunday,I had an opportunity to go to Sth Melb mkt. Very claustrophobic! quite a number of people, but as I say, the mkt is a small space so it can look like alot of people,not from the colorful spruiking our food people do, just people are visiting,in the deli section come meat section come fish section!! Awful to walk thru,people with trolleys,screaming children,and noisy, the butchers were way overpriced as compared to ours!! In my humble opinion,this mkt is superfluous in our city,yes,unneeded,bring them over to us and develop the land this square box you call a mkt. stands on!! I really really mean it!! They have an hour long free parking bays around the perimeter,that were constantly changing cars a few disabled spots,and parking on the top. Channel 7 News included a segment on QVM re-development this evening. Apparently the city is waiting on a final tick of approval from the State Government for the construction of two 50 storey skyscrapers on market land at the Southern end of the current carpark. The plan involves an extension of Franklin St. through the market carpark to link up with Dudley St. and the sale of the land to the south of that road to finance a re-development of the market. The carpark itself would be turned into a new community garden. 7 news can reveal part of QVM will be sold off and 2 new skyscrapers will be built to pay for the redevelopment of the iconic site. the current car park will be turned into gardens with the plans now awaiting the final tick off approval from the State Government. "Its the biggest facelift in its 130 years." "I would love to see it being the Fed Square of the other end of the city, a real hive of activity"
"The Queen Victoria Market will effectively be cut in two, Franklin St will be extended to join Dudley St creating a new thoroughfare from the east to the west of the city via Victoria St. Part of the Market will then be sold off and 2 fifty story skyscrapers will be built to help pay for the $100 million upgrade." "There are unused portions of the land around the Market and you might think of what might the commercial partnerships you had there". Plans currently before the Department of Treasury also reveal the current car park will be turned into a new community garden. 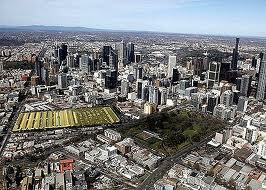 It cant be built on as it is the site of Melbourne's first cemetery, and 6,000 graves are still there." "No car park, no market". "One of the challenges for Traders here is the lack of onsite power and just how to keep all of this food fresh, so the new development will include digging beneath these Heritage listed sheds and installing giant refrigerated units under the ground". "The Market survived 130 or more years without it, yeah so we'll just keep on going, what we need is a car park not redevelopment". 18/4/2013 2030 Market Re-development " So looks like we have been done over again. Market administration said there were no plans, and now we see there are plans in front of State government. Looks like we are being treated like Mushrooms, keep us in the dark and feed us s....! Retailing icons like J.C.Penney and Macy's attempted to move away from a special deals/sales model to a fixed everyday low price model and both failed. Where do markets fit in with the whole retail strategy debate? Macy's acquired the May department stores back in 2006 and attempted to dismantle their coupon based weekly sales system so as to "retrain" their customers. By 2007 they had abandoned the "retraining" and gone back to a modified sales price enticement model. J.C.Penney recruited high profile Apple retail whiz, Ron Johnson, in 2011 who set about changing their weekly sales and coupon model to a fixed price model. But his departure this month after a disastrous 25% drop in 2012 sales has seen a complete re-evaluation of strategies by J.C.Penney. And if you think the experience of those two retailers makes the picture any clearer consider the successful fixed price/ everyday low price model of our own K-mart and the US giant Walmart. K- Mart has made a roaring success of super low prices on key items and the expectation is that customers can enjoy those prices everyday without having to wait for a special sale. Walmart has a similar philosophy. Just to muddy the waters a little bit further, Walmart have found that in markets like China and Brazil their customers respond to the old-fashioned model of across the board higher prices with super discounts on a select range of goods. So it is obviously a case of "horses for courses". Of course, attracting customers isn't just about low prices. Unique and new products, a wide choice, and a shopping adventure of discovery are just some of the key ingredients of a popular shopping destination. A key marketing tool for the top end of the Queen Victoria Market is the Shop The Sheds campaign. Shop The Sheds relies on traders offering a minimum 20% discount on an item or range of items. That was bolstered by a coupon system on Facebook although Facebook now charge for the coupons so QVM have dropped the option. Promotion of Shop The Sheds is through Facebook, other social media like Foursquare, the Marketlife magazine with its 100,000 local distribution, and internal leaflets. Shop The Sheds is not getting great results and the question needs to be asked - Is a pure discount model the correct way of promoting the top end of QVM? Should we adopt an everyday low price model or should we avoid price reference all together? Traders Representatives and QVM management are currently considering how the campaign might be tweaked to get results. One option we are considering is identifying key products in the market that stand alone as desirable, unique, and competitive without having to adopt a "bargain basement" discount approach. One of the unique things about our market is that it is full of specialty retailers and specialising often leads to innovation and new and exciting products. As always we rely on traders to feed ideas to us and we welcome your input. If you have a product(s) that meet the "desirable, unique, and competitive" criteria please contact us. Click on the Have Your Say link below, talk to your Trader Representative, or email us. There is much tradition to enjoy at Melbourne’s Queen Victoria Market. The open heritage sheds offer a unique retailing environment and the voyage of discovery is enhanced by the hustle and bustle of market trading. But there are some aspects of Victorian era trading that are best left behind and dim lighting is one of them. In the Victorian era it was gas lighting and some areas under the Queen Victoria market sheds would struggle to improve on the light cast by an open flame. Readings as low as 15 lux have been recorded during normal trading hours in K shed. Emergency stairwells, corridors and passageways require a minimum of 40 lux to meet Australian Standards. 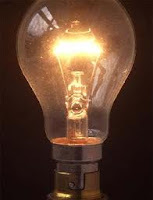 Our research suggests we are far short of the light levels required for the most basic food preparation and counter activities let alone for retailing purposes. Customers have come to expect modern facilities at the Queen Victoria Market like scrupulously clean food serving areas, electronic EFTPOS facilities and digital online access to market services. 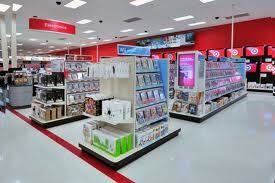 Basic needs like lighting need to keep pace with modern retailing. Lighting a retail environment is almost a science unto itself and elements of electric lighting, natural lighting and stock merchandising all need to be taken into account. It is time this matter was given appropriate attention. Our customers deserve a better trading environment. 18/4/2013 1335 Lighting "John Magno here, just wondering where the LUX METER is today. The lighting is shocking. You all really need to get on to it ASAP, IT'S SHOCKING!!!" Latest Retail News – 14/4/20131. Australian Traders Group calls on political parties to reduce GST free threshold on online purchases. 2. Woolworths launches full service beauty bar at Sydney’s Town Hall store. 3. Spanish fashion chain, Mango, teams up with David Jones in Australia. 4. Online retailers protest at latest Australia Post slug on parcel deliveries. 5. Myer to upgrade Adelaide Rundle Mall Store. 6. Britain’s troubled music retailer HMV rescued by US restructuring fund. 7. Ibisworld predicts slight drop in fashion sales for 2013 before consumer splurge in 2014. 8. New shopping mall in Santiago Chile sells just sports and fitness related goods. 9. High profile J.C.Penny CEO departs after unsuccessful restructuring. 10. Samsung Experience Shops to be launched in 1400 Best Buy stores across America. 11. Coles signs 10 year milk products deal with Devondale. 12. Dolce & Gabbana to launch first Australian store in Melbourne’s Collins St. this year. 13. Jeweller, Michael Hill, reports 8.8% sales increase for first three quarters. 14. ABS reports one third increase in internet downloads in 6 months to June 2012. 15. Major Australian shopping centres engaging in retailer support programs. 16. $300 million shopping centre planned for Darwin. 17. ACCC launches online education program for small business. 18. Woolworths quarterly sales rise by 2.5%. What Drives Low Consumer Confidence? NAB’s Australian Consumer Anxiety Index gives some interesting insight into what drives low consumer confidence and it may not be what you think. High profile job losses in Victoria, particularly in the car industry, have fuelled speculation that job loss fear is a key ingredient in low consumer confidence but in fact the major factor is the high cost of living. More than 40% of those interviewed said this was a major cause of anxiety with government policy running second (36.4%) followed by ability to fund retirement (31%). Just 16.7% of those surveyed listed anxiety over job security highly. As expected the least anxiety was found in the younger and the older participants with the highest level evident in the 30-49 age group. 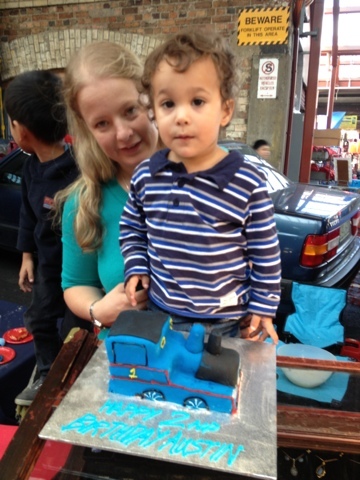 Our youngest honorary stallholder celebrates his second birthday. Happy Birthday Austin! 13/04/2013 19:35 Rent Payment "I wouldn't have thought there was much chance of traders agreeing to Direct Debit - sadly no trust in the system - but an option to pay online may be welcome." 11/04/2013 18:52:21 Lighting "Thought I would measure the light in my stall today... It was 14 lux! Just to give you an idea of what that means, a candle one foot away provides the equivalent of 10 lux. That might be great for a candle light dinner but it is disastrous for trying to do any business! " 11/04/2013 19:41:48 Queen Street "Creating excitement in queen St is one thing. .. but competition for us existing trader's id another. Sure its good to have something in queen St, what about kids rides & making it a family day. I don't understand why the office insists on always cutting us off, don't they get by putting these events on, it stops the shopper from moving around in the sheds..instead of applauding this why don't you represtatives actually do something about it ..." Sounds like this is a serious issue for you and one worthy of a Trader's Representatives attention. Please talk to your Trader's Representative or ring me on 0406 222 020 to discuss - Ed. Consumer Sentiment In Significant Fall. The Westpac Melbourne Institute Index of Consumer Sentiment fell by 5.1 per cent in April from 110.5 in March to 104.9 in April. The previous 2 months had risen 9.9% so some softening was expected but not such a significant decline. Westpac Chief Economist said it was a surprising result and indicates the fragility of consumer confidence. According to Evans the reasons behind the April fall are best assumed to be around global concerns and an associated correction in the share market. Uncertainty surrounding Europe’s economic recovery might be given as an excuse for declining consumer confidence but it can be assumed that Australia’s looming federal election, and our rudderless leadership (pun not intended) hasn’t helped. "There are over 2 million small businesses in Australia, employing over 7 million people. That’s over 60% of our workforce. Yet, for too many years, small business has been overtaxed, overregulated and overlooked by government." Although they are from the same stable (Wesfarmers) Target and K-mart have experienced different retail fortunes over recent years and the sudden departure of yet another Target MD this week is just part of the story. K-Mart has been able to resurrect itself from near oblivion in 2007 to a discounting power house and a key performer in the Wesfarmers stable. K-Mart has successfully re-branded itself as the cheapest place to buy a variety of department store merchandise. 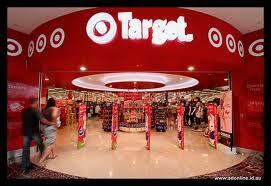 Target on the other hand has just appointed its third boss in five years and sits uncomfortably between the likes of K-Mart and the more upmarket department stores like Myer and David Jones. The challenge remains for new boss Stuart Machin to get Target on the move again. Successfully branding yourself is a key element for retailers and begs the question - Where does QVM sit? What Colour Is That Garment? - A Lighting Issue. One of our traders writes "Brown" on the tag of her dark brown garments and "Blue" on the tags of her dark blue garments because otherwise she can't identify them. And that is not because of poor eyesight, it is because of poor lighting. Under the sheds at QVM can be very dark and this was a common complaint at trader/management meetings last year. Much has recently been done to lighting under the sheds and yet the emphasis seems to have been on economy rather than achieving better vision. The problem is not consistent throughout the market. The north side of K shed has a light above each stall and they seem to have adequate lighting. The south side of K shed seems to be the source of some of the worst lighting conditions in the whole market. In the rear of K and L sheds, the roof (and lights) are so high that effective merchandising becomes very difficult. Areas of C, D, and E sheds have similar problems. Traders may have noticed some one-off test lighting in Rear L where smaller hi-tech lights appear to add extra light. We say "appear" because this can be a very subjective assessment although if you have a smart phone you can get a couple of free apps to actually measure the light. For iPhone try Whitegoods Light Meter or Luxmeter. Taking lux readings around your stall and comparing with other areas may help you become more objective about the lighting at your stall. And this is not just about adding extra lighting it may involve more skylights so we can harness more of that very economical ingredient, natural light. It may also involve lowering stall displays so that everybody gets a fair share of available light. There is a lot about QVM's traditional setting that is very attractive but dark and dingy is not on the list. We need to fix the lighting under the sheds if we are to meet basic customer expectations. 07/04/2013 22:50:12 Lighting "If more skylights were to be put in they need to be covered during the really hot days as they intensify the heat in summer, thus making our stall really hot. I don't know why we just can't have the power they keep promising us, when certain stalls that only use it for lighting are allowed to have it." 08/04/2013 10:00:59 Lighting "The Trader comment is actually touching on 3 separate but connected issues. 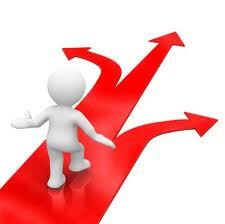 I suggest it is best to deal with them separately so as to ensure achieving the best possible results in all areas. So whilst it is true that one area will often impact on another, what seems to be happening is that the difficulties in dealing with any of the above mentioned issues is canceling out the resolution of any of the issues. This is totally unacceptable and all 3 areas need to be resolved now. We are living in 2013 and should no longer be trading in ""dark age"" conditions. This is, in fact, yet another example of the almost complete neglect of the GMT area. So whilst the powers that be are more than happy to collect an enormous amount of rent money (some calculations say it is between $150-170,000 per week, yes per week) from GMT traders, the money spent to rectify the most basic sub conditions we have to trade under is negligible and practically non existent. " 08/04/2013 21:00:10 lighting issue. "How about the idea of roof fans. I thing it would serve two purposes. 1. Cool down and circulate the air.it would be a welcome relief on those hot summer days for both traders, and customers. 2. I imagine the fans would also deter the the birds from making nests etc. I'm sure the cost would be recovered, from the amount of traders taking days off because of the heat . 09/04/2013 10:05 Lighting Issue "Good thinking Skippy". The QVM's resident gelato maker, Andrea, made it to the Age’s Epicure pages this week. And did you know he is an Internet Consultant when he is not serving up delicious gelato? 1. Brown Sugar, trading under Brand Direction, has been placed into administration for the second time. 2. Costco to open its first store in South Australia. 3. Reserve Bank leaves cash rate steady at 3%. 4. NAB Online Retail Sales Index dips slightly in February. 5. Singapore based luxury brands retailer, Reebonz, opens store in Sydney. 6. BIS-Shrapnel reports corner stores losing the battle against chains. 7. Retail trade rose 1.3% in February. Source: Australian Bureau of Statistics. 8. Australian pie chain, Pie Face, plans expansion into India and Indonesia. 9. Aldi opens first convenience store outlet in UK. 10. Target expects Home Decor to become the new fashion in 2013. 06/04/2013 09:48:59 Completing a stall application "Hi all, I am in the process of completing an application to have a stall at QVM. I was wondering about the part where it asks about licensing and trademarks and having the right to sell brand name products. I sell many different kinds of products so would I need a seperate license from each of them? My understanding was that my supplier is authorized by the manufacturer to sell these products and that authorization basically passes over to the retailer. Is that right? Do I need to provide some type of documentation with my application? Also, any other tips in completing a successful application would be greatly appreciated. 07/04/2013 2245 Completing a stall application "Hello Bill - You really need to ask QVM staff if you have any doubts about licensing arrangements. They are a pretty friendly bunch. Generally if your supplier is licensed you shouldn't have a problem. Management will be trying to avoid any legal complications from traders working outside established licensing arrangements. Good luck with your application. We hope to greet you as a new trader soon." Ed. 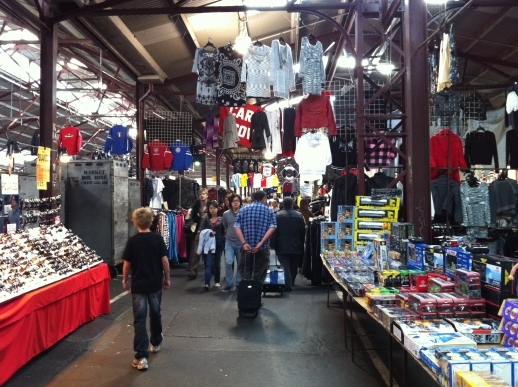 Trading areas at the Queen Victoria Market are generally categorised as Food or General Merchandise. Food is food, and I don't have a problem with the term (I assume Food Traders feel the same) but General Merchandise is just too general and doesn't adequately convey the rich offering in the top end of the market. In fact, trade in the top end is the opposite of "general", it is "speciality". General Merchandise Traders are Speciality Merchandise Traders because each trader specialises in a particular category and gives it a richness, depth, and level of expertise that most other retailers can't. The depth of offer in categories like jewellery, sports shoes, socks, handbags, hats, souvenirs (and the list goes on) is rarely exceeded outside the market. The other important aspect of the "Speciality" tag is of course the high level of personal service and expertise that the name implies. In contrast with today's impersonal department stores, QVM Traders offer a face to face experience to each and every customer and that is an advantage we should maximise. Add in the level of competition offered by multiple traders in each category (some see this as repetition, I see it as healthy competition) and it is no wonder that QVM is a very desirable place to shop. I would like to see QVM described as a place for Food and Speciality Merchandise. New QVM Food Activity In Queen St. The latest street food festival to hit Queen Victoria Market! Taking over the Queen St precinct for 10 Sundays only, A Taste of the Market will feature some of your favourite traders from Suzuki Night Market and Luna1878, serving up local and international fare from Sicilian BBQ to Malaysian Dumplings. Kicking off this Sunday 7th April with free entry & entertainment, Sundays just got even more exciting at Queen Victoria Market! Creating a buzz in Queen St. is to be applauded although Food Court retailers may not be so excited as they face even more competition. 11/04/2013 19:41:48 queen street "Creating excitement in queen St is one thing. .. but competition for us existing trader's id another. Sure its good to have something in queen St, what about kids rides & making it a family day. I don't understand why the office insists on always cutting us off, don't they get by putting these events on, it stops the shopper from moving around in the sheds..instead of applauding this why don't you represtatives actually do something about it ..."
Do You Own A Smartphone - And Do You Use It?